Facebook has been trying to get me to buy an Oculus Rift all weekend. It's not even a proper ad, just a weird looking Facebook post going, 'Get Oculus Rift for only €399!' And I'm like, do I look like I have 400 euro just lying around? I'm an unemployed student with bipolar II disorder, and I've got rent to pay. I’ve blocked Facebook from tracking me. I don’t do Facebook, Instagram, or Twitter. I don’t even let Google track me and I actually have gmail accounts – but I use Apple’s Mail.app to access them. That's beyond fair. Sadly, I'm kind of dependent on Facebook, or I wouldn't bother either. I used to know a very confused straight guy when I was homeless. His drinking problem was under control while he was staying at the rescue mission (and he had no access to alcohol). Once he had completed their ‘Program’ and was released back into the world, he relapsed. But he preferred baby powder (talcum powder) scented deodorant! And he kept confessing his ‘love’ for me when he was drunk because he confused love with caring. That's . . . actually kind of sad. Poor guy. I used to prefer neutral scented deodorants, but now I kind of like the more 'man' scented ones. Probably because they make me feel more masculine, which is a thing I need right now. I use as many unscented products as I can. While I don’t have a chemical sensitivity, I’ve always disliked strong fragrances. Department store cosmetics counters used to be torture in the ‘70s! I’d actually hold my breath when we walked through them. And they’re usually planted right at the busiest entrance to the store so the largest number of victims is assaulted by the stench! I get that walking through the duty free when I travel. The make-up department is almost always by the entrance, and you walk through this cloud of perfume, basically. Some airports have started moving them, though, cause of complaints from people with severe allergies for whom strong fragrances can be uncomfortable at best and dangerous at worst. Oh God! The days when most men wore Old Spice or Brut. Ugh. I got Brut at Christmas for about three years... I ended up hating it. I'm not adverse to a nice cologne, and I wear Terre D'Hermes on occasion, but those areas make me gag. I like Old Spice. Gave up on Brut 'cause I didn't have the legs for it 😃 I prefer unscented products but they are becoming more difficult to find. 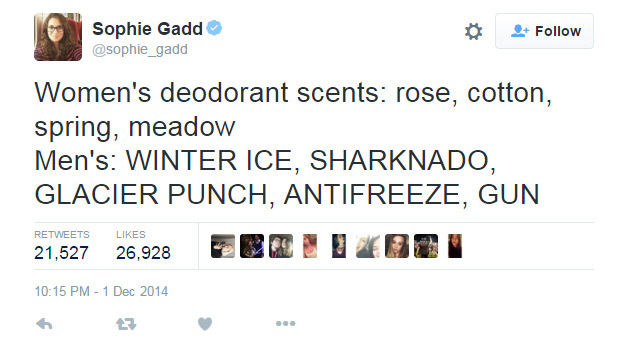 I use Old Spice High Endurance deodorant... I never use antiperspirant, and I find Old Spice is effective from shower to shower, and doesn't overpower. I grew up with every boy in my class overusing Axe body spray. Can’t stand the stuff. The girls all bathed in cheap flowery perfumes from H&M. Middle school was hell on the senses. I grew up with every boy in my class overusing Axe body spray. Can’t stand the stuff. The girls all bathed in cheap flowery perfumes from H&M. Middle school was hell. My youngest son used to douse himself in Axe... but the abuse from his siblings soon fixed that. Macy’s thinks it’s okay to pollute the very controlled environment of the International Space Station with bits of styrofoam ‘snow’! They might think it’s a cute idea, but it’d be a disaster to have to clean up after when it floats around and ruins scientific experiments. It would take forever to vacuum up all the tiny particles in the scientific laboratory. It’s another example of New York hubris. Last line in a Honda ad.